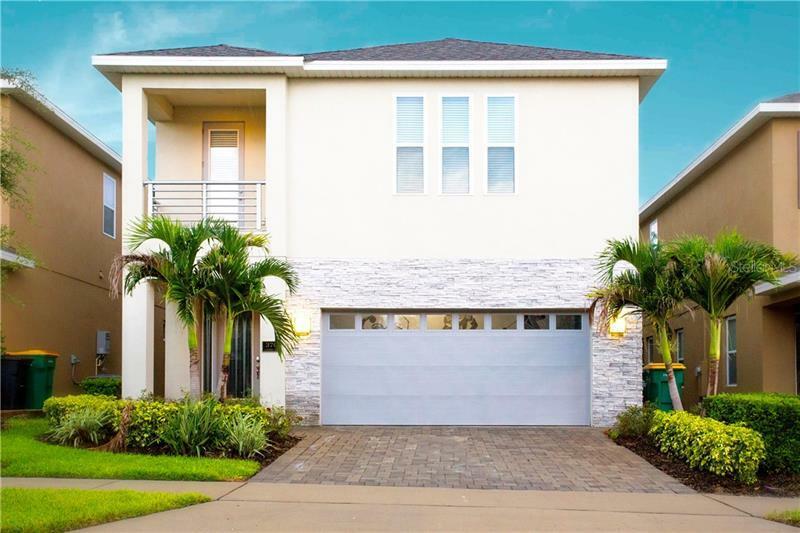 Why build and wait when you can buy this beautiful almost brand new and fully furnished 8 bedroom, 7 bath, 2 car, pool and spa home on the premier gated resort community of Encore Club. All bedrooms have en-suite bathrooms that have granite countertops as does the gourmet kitchen which features 42" wood cabinets and stainless steel appliances. Having 2 Master suites is perfect and key for vacation rentals or extended family vacations. The heated pool and spa, brick pavers, beautiful interior design package and game room are just some of the upgrades in this fantastic vacation home that offers substantial income opportunities. Relax and enjoy as the HOA maintains your pool, lawn, and landscape maintenance, which will give you more time to enjoy the luxury lifestyle amenities Encore at Reunion Resort offers. The resort community pool features water slides, splash pad, beach volleyball bar/restaurant and other beach-side amenities. The indoor recreation includes large screen TV, gaming systems, snack market, and arcade room. Guest Services will assist with anything from scheduling transportation to catering as well as help you navigate the monthly resort community schedule. Encore Resort is located just minutes from Disney, outlet stores, I-4 and all Orlando attractions.